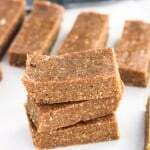 I’m keeping the almond butter love going with these almond coconut energy bars. 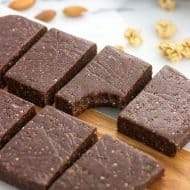 In a world of nine million fancy pants (and often pricey) snack/energy bars, Larabars are toward the top of my store-bought favorites list. I usually reserve them for road trip or flight snacks as a little incentive to motor through the hustle + bustle (re: stress) of travel. In fact, one of my super early Instagram posts was of my TN –> CA plane Larabar, which I savored in no fewer than twenty bites. Some part of my mind can’t reconcile with spending money on them for a regular snack, so they’re in that special travel category to be enjoyed leisurely. Larabars…I like them. One of the main ingredients in Larabars are dates, which are a key part of this soft but hearty texture we’ve got going on here. Sweetness, too! 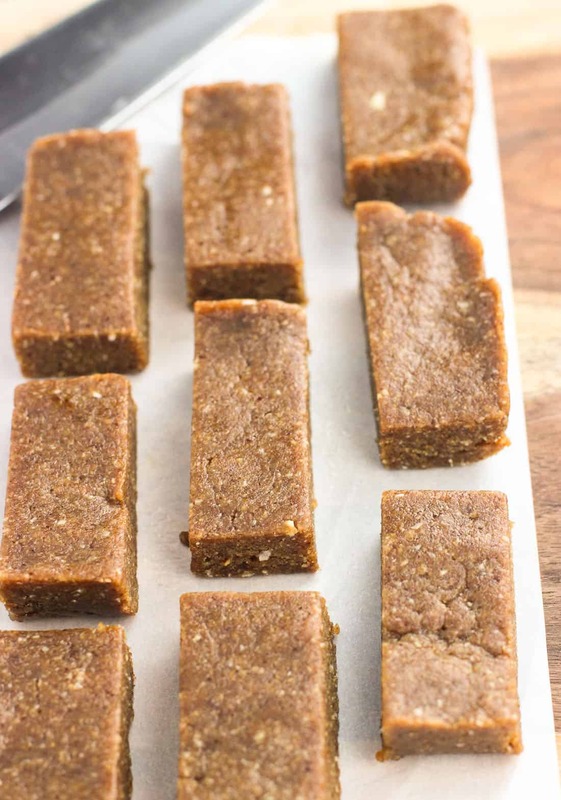 These bars use just five natural ingredients and are prepped in a food processor. There’s no baking necessary, too, as all they need is a bit of refrigeration to cool down and firm up. Along with those dates I added almond butter, unsweetened coconut flakes, almonds, and ground flaxseed. While dates have fiber, they’re not exactly protein-rich. 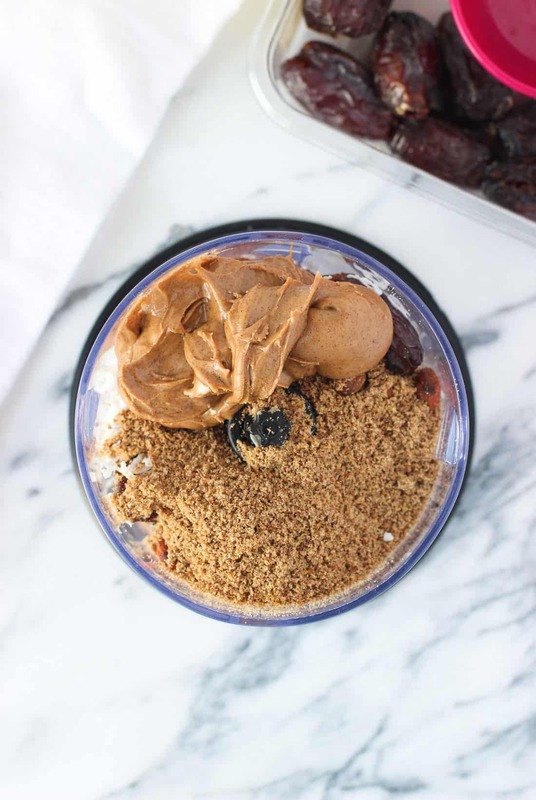 Almond butter and roasted almonds to the rescue! The almonds add a nice occasional mini crunch to these bars because little crunchy pieces will remain in the finished product. These bars are dense and chewy, which personally helps me feel that I’m eating a substantial snack and become satisfied. Rather than mindless eating chomping away on pretzels, you know? Flaxseed adds to the fiber content, and the coconut flakes give such a nice, not overpowering coconut flavor. I used unsweetened flakes, which I found right next to the sweetened flakes in my regular old grocery store. I like using the unsweetened ones in snacks like this because they give flavor without all that added sweetness. And coconut and almond butter? Yum! Their flavors work together wonderfully. One…detractor, I’ll say that sometimes comes along with homemade bars is that they aren’t the best travelers out there, as they tend to lose a bit of structure when they’ve been left out at room temperature. I store these bars in the fridge, but several times I’ve taken them to work and left them unrefrigerated for a good 7-8 hours. While they were a little softer, they still held up and weren’t messy at all. Which is a good thing, because who wants to worry about coworkers digging in the fridge and having the willpower to avoid these? 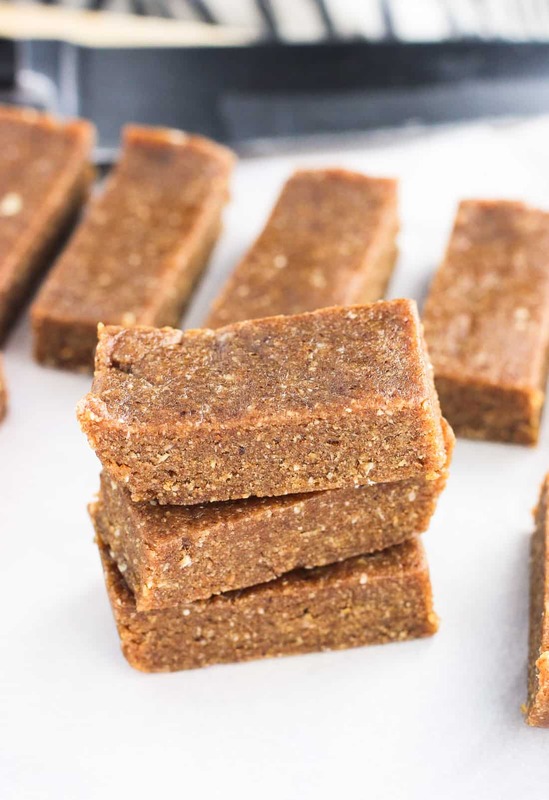 These five-ingredient Almond Coconut Energy Bars are dense and chewy with a consistency like a Larabar. 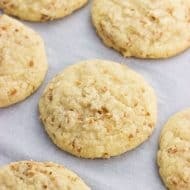 Great almond and coconut flavor and they're vegan! Place all ingredients in a food processor and blend for one to two minutes, or until everything is evenly combined and just about smooth. You may still have little crunchy pieces of almonds remaining. Line a 9" x 5" loaf pan (or a small dish) with parchment paper and press bar mixture evenly into about half of the pan. Refrigerate for at least 45 minutes so the mixture sets. Once chilled, cut into bars and store in the fridge. I suggest keeping these bars in the fridge to maintain their consistency, though I've kept them out at room temperature for 7-8 hours without an issue. They just were a little bit softer. 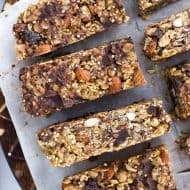 I adore homemade energy bars–such cleaner ingredients and the combo of almond and coconut really hit the spot. Any idea what the nutritional content is per serving? Hi Steph, I’ve just updated the recipe with the nutritional info. Of course it may vary slightly depending on the brand of ingredients used, but it should be pretty close! Hi there! Can I use something other than coconut flakes? Hi Ashley, I’ve never made these bars without the coconut flakes so I couldn’t say for sure, but I think they could work without. I’d maybe try increasing the almonds by an extra tablespoon or two, or an extra tablespoon of the ground flaxseed? Let me know if you give them a try! These bars look delicious, Alyssa! I love making homemade snack bars to bring to work and just to have for the week. I think I need to pick up the stuff to make these! Thanks Danielle! I’m definitely on the homemade snack bar train now. Larabars are a staple for traveling for us too! Love this homemade version … especially with the almond coconut flavor! Oh anytime, for sure! 🙂 Thanks Sarah! I am a huge fan of larabars and these look just as amazing, if not better! 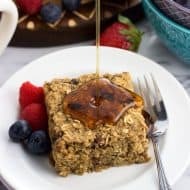 I’m always looking for great homemade granola bar recipes, so I def need to try these out! I’ve been buying something similar to this lately, to eat at work. But it’s so much more fun to make your own! And to add whatever you like. 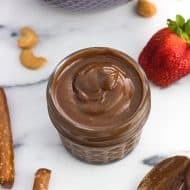 I love the idea of adding almond butter and coconut. Some of the ones I’ve bought lately have been a bit bland, but not these! Mmmm! Any homemade bar or bite I make goes straight in the freezer! I love the chewy firmness that comes about and eating them straight cold from the freezer!